A manual offers advice to patients dealing with the long-term effects of a medical crisis. In this debut health book, Cohen draws on her professional experience as a rehabilitation specialist, as well as her personal experience with a series of medical errors that led to chronic difficulties, to guide readers through the process of managing the practical and emotional challenges of life-changing medical problems. Drawing on case studies, medical research, and common sense, Cohen advises readers on matters including how to adapt to the changes in lifestyle that may be required by physical limitations (“Adjustment is a much more active and empowered process than acceptance”), suggestions for alternative and complementary treatments (Cohen “entered acupuncture treatment a true skeptic but a desperate one”), and strategies for facing and working through the emotional challenges of medical problems. The book encourages readers to be active participants in their medical care, communicating with doctors (“You can articulate your needs and educate your physician about your expectations using a polite tone without an emotional meltdown”), reading all paperwork before signing, and asking for more information whenever it is necessary. The book explains the forms of rehabilitation and treatment that may be necessary (physiatry, occupational therapy, and so on) and addresses the possible paths to resolution if the medical problem is the result of practitioner error, including recommendations for ensuring mistakes are minimized in the future. Cohen’s writing is clear and engaging and manages to both avoid melodrama and acknowledge the validity of strong feelings in difficult situations. She often manages to capture the emotional core of complex stories, as in her description of watching a live-streamed Kol Nidre service while unable to leave the house and attend her local synagogue. The result is a book that is both practical and compassionate, providing guidelines for adapting to the reality of life with a serious or ongoing medical condition, giving readers practical advice for shaping their new existences while allowing for the need to mourn abilities and opportunities that are no longer available. 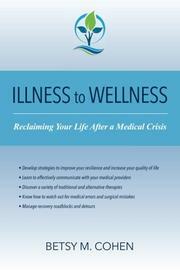 A comprehensive and well-written guide to managing serious medical problems.